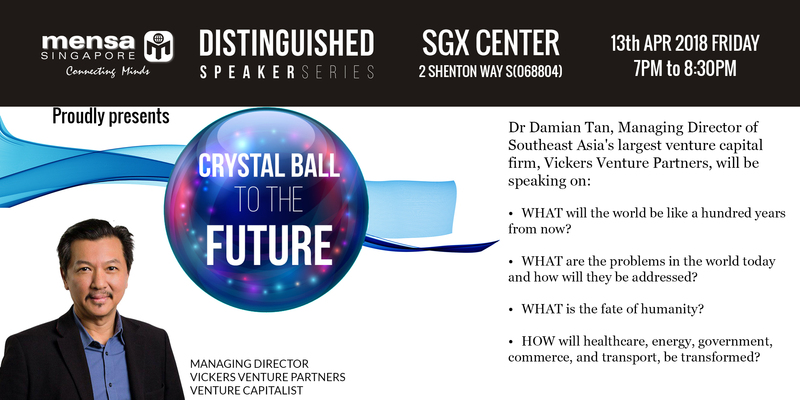 Mensa Singapore is proud to announce our inaugural Distinguished Speaker Series – Crystal Ball to the Future with Dr. Damian Tan! Venture capitalists routinely spend millions of dollars today in order to obtain returns that pay back ten-fold tomorrow. But to do so, they need to forecast far into the future and see what “magic” will become possible and how it will change our world. Dr. Damian Tan is one of Singapore’s most prominent Venture Capitalist and sits on various investment committees. His job revolves around asking precisely these questions about future technology and trends. Come and hear Dr. Tan give a brief glimpse into the future, at Mensa Singapore’s inaugural Distinguished Speakers series, and maybe, you will start to believe in magic as well. Tickets are sold at $10/pax.